A - To measure the actual currents flowing, i.e. the motor current, receiver current or ECU battery current (in jets) A useful tool for tasks such as optimising the power system (how much current the motor draws with different propellers) and for avoiding overload situations, e.g. the presence of stall currents when the model’s receiving system is at idle could indicate incorrectly set servo travels. B - To indicate the residual charge in the battery: virtually the "fuel gauge” for the battery. Knowledge of the residual charge is indispensable, especially when your model is fitted with modern high-performance LiPo batteries (e.g. Li-BATT FX), since the voltage of these packs remains virtually constant for a very long time during the discharge process, but then "collapses” in seconds. 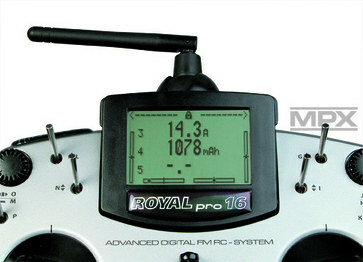 This means that monitoring the receiver battery voltage is no longer adequate, and even timers can only offer avery approximate guide. The current sensor is connected to a telemetry-capable receiver, or to another sensor on the MSB. 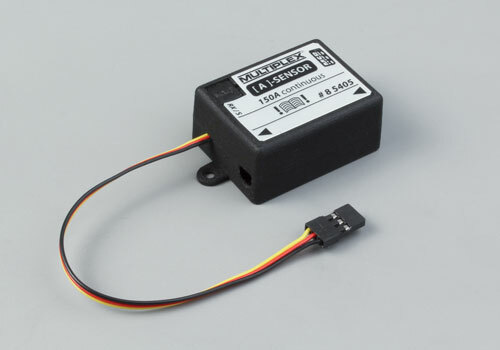 The sensor is looped into the negative connection between battery and consumer unit; suitable high-current connectors or cables are attached to the solder pads (# 8 5404 / # 8 5405). 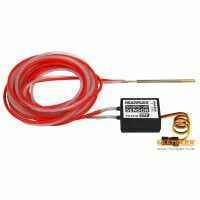 The sensor’s basic function "output of actual current flowing in A” can be used immediately, typically to monitor the current drawn by the electric power system. 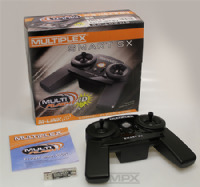 Once you have activated the charge counter using the MULTImate (# 8 2094) or the "MULTIPLEX Launcher”** PC program, you can forget about relying upon a timer for your flight times; instead you can fly according to the actual residual charge in the flight battery. Used in this way, the current sensor becomes your electronic fuel gauge! Protect your valuable batteries from deep-discharging, which can seriously shorten their useful life. Minimum current at which the software starts counting in order to calculate the average value. Note: only applies to the "Average value” option. Defines the point at which the measurement is to commence after switching on. or percent (%) (percent is only useful if you previously entered a battery capacity as reference value). Battery capacity: Capacity of the connected battery. Alarm: Residual value at which an alarm is to be triggered.